Allergy-causing substances like pollen and dander may cause dilatation of blood vessels in the conjunctiva, the membrane covering the eye. 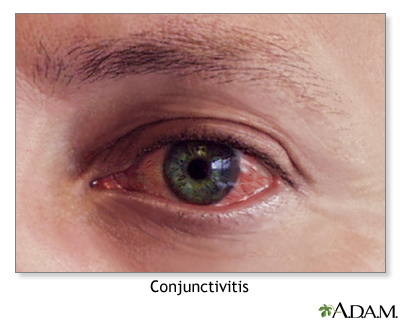 The resulting reddening of the eyes is called allergic conjunctivitis, and is usually accompanied by itching and tearing. Updated by: Stuart I. Henochowicz, MD, FACP, Associate Clinical Professor of Medicine, Division of Allergy, Immunology, and Rheumatology, Georgetown University Medical School, Washington, DC. Also reviewed by David Zieve, MD, MHA, Medical Director, Brenda Conaway, Editorial Director, and the A.D.A.M. Editorial team.